Companies such as Autodesk are fast replacing the once-true- and-tried physical data warehouses with logical data warehouses/ data lakes. Why? Because they are able to accomplish the same results in 1/6 th of the time and with 1/4 th of the resources. 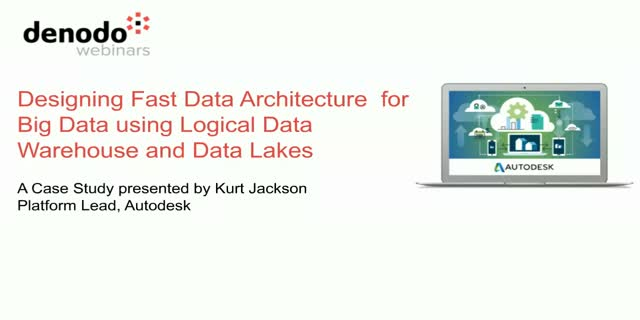 In this webinar, Autodesk’s Platform Lead, Kurt Jackson,, will describe how they designed a modern fast data architecture as a single unified logical data warehouse/ data lake using data virtualization and contemporary big data analytics like Spark. Logical data warehouse / data lake is a virtual abstraction layer over the physical data warehouse, big data repositories, cloud, and other enterprise applications. It unifies both structured and unstructured data in real-time to power analytical and operational use cases. Become a fast data strategy expert in one hour!